We all know the feeling of walking into a nice hotel room, dropping our bags, and falling onto a crisp, white, fluffy hotel bed. Whether it’s the fact that it’s a new bed or the fact that someone else cleans it, hotel rooms inspire a sense of excitement. If you love the feel of sleeping in a hotel room after a long day of being a tourist, we have good news. You can redesign your home, and in particular, your bedroom, with luxury hotel decor. You will feel like you are walking into a fancy hotel every time you walk through your front door. At Omorfia, we specialize in bringing beauty into your home. Call us today for a free 30-minute phone conversation. Or we can schedule a 90-minute personal design consultation for $99.00. When it comes to your bedroom, the bed is king. When you walk into a luxury hotel room, the first thing you generally notice is the bed. Usually, beds are placed prominently in the room, and are typically white, fluffy, and decorated with beautiful and inviting pillows. Even more, the room’s curtains perfectly coordinate with the bedding and pillows. To achieve the luxury hotel look in your bedroom the first step and best place to spend a chunk of money is on the bed. Investing in a supportive mattress will prove worth it when you wake up refreshed every morning. Topping that mattress with high-quality sheets will make for an even better night’s sleep. Go for the highest thread count you can afford. Finally, purchase a nice down comforter (or down alternative if you are allergic to feathers) and down or memory foam pillows to finish the luxury bed. One thing you will notice is that beds in luxury hotels almost always have a plush headboard. You want to be able to lean against it and still be comfortable. There is a particular design flow most designers follow in luxury hotels. You will always find a bedside table on each side of the bed with lamps, a desk, some inviting chairs, and a coordinating side table, an armoire, and a television. The bedroom is a great place to invest your money. You spend a significant amount of time in this room. However, many homeowners skimp in this room, since other people don't often see it. A sign of a truly luxurious hotel is an incredibly serene bathroom. You often feel like you are walking into a spa when you enter the bathroom. Luxury home decor isn’t solely for the living room and bedroom. 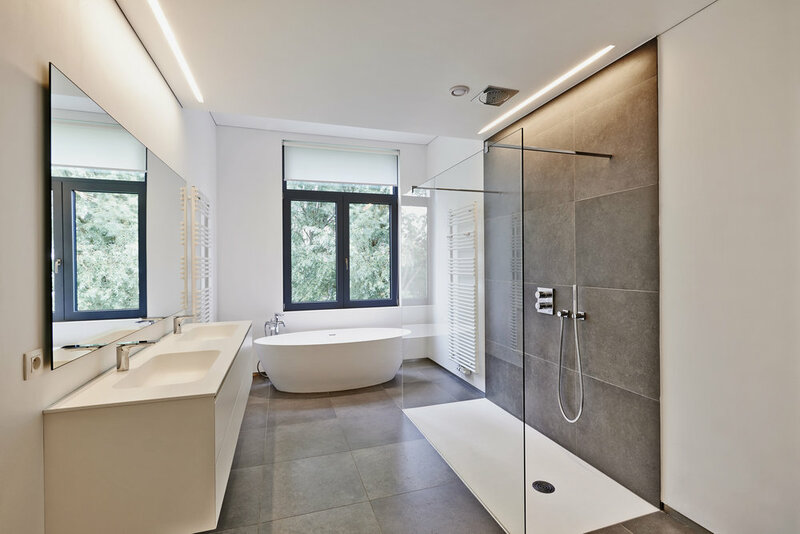 In a luxury bathroom, you will most likely find a walk-in shower with glass doors and walls around. To top it off, there are probably full-body jets and a rain shower head. Without a doubt, there is a large tub you can’t wait to soak in. You also typically find two sinks that are deep and made from an expensive material. When you look up, you will see a large wall mirror with an intricate frame surrounded by fancy lighting. There are plush, soft, and absorbent towels hanging on several racks around the room. And let’s not forget the bathrobe made from high-quality cotton. If you want to step things up a notch, invest in a towel warmer to ensure a warm towel every time you exit your luxury shower. Imagine your feet never being cold because you have heated flooring. You might never want to leave your bathroom! Realistically, investing in a beautiful shower curtain, some plush towels, scented candles, and new rugs can drastically update the look of your bathroom. Hotel designers know what they’re doing. The first thing you will see to establish your impression of the hotel is the entryway and lobby. You are drawn in by expensive stone, elaborate wood carvings, comfortable plush seating, and orchids galore. You will see your reflection in fancy mirrors, at least what you can see with the dim lighting. And of course, there is fantastic artwork. Creating an entryway that rivals luxury hotels can be simple. If you are looking for elegant home decor for your entryway, look for a focal point or centerpiece that will draw the eyes of guests to your home. Look for a table for your entryway that is sophisticated, but not obtrusive. If you have enough space, look for a large, round table to make a dramatic statement. Find an attractive lamp, a beautiful bowl, a few books to show your interests, and a striking flower arrangement. Avoid fake flowers, though. If you don’t have space for a table away from the wall, place it against the wall with an intricate mirror above it. If you still have any area, consider an inviting chair that will allow guests a place to sit when removing their shoes. In the rest of your home, there are some things you can do that will scream luxury. Investing in high-quality curtains that coordinate the room decor without being distracting is worth some money. Controlling temperature is vital. In a luxury hotel, the climate is perfectly controlled, so guests are not too hot or too cold. Consider installing a programmable thermostat to ensure the temperature is always perfect. Luxury home decor can’t be properly enjoyed without proper lighting. A hotel is always full of beautiful overhead lighting, as well as lamps, sconces, chandeliers, and mood lighting. Install a dimmer to some of your lighting and strategically place lamps throughout your home. Potentially the most important thing is to achieve the luxury hotel look is home organization. You can make your home feel fancy without purchasing a single piece of luxury home decor if you declutter and arrange your home efficiently. Make a space look purposeful and inviting. Whether a nook or main living area, spaces should be well-designed and free of clutter. Finally, flowers and greenery are a must! Nothing screams luxury like colorful, fresh-cut flowers throughout your home. If you want your home to feel like a luxury hotel, but don’t know where to start, give us a call at Omorfia. Whether you are looking to make significant changes, or are working with a smaller budget, we can help you. Contact us to see how we can bring beauty into your home.